The other man of the house got his quilt just in time to start Kindergarten. He goes to school in the very same classroom I went to 25 years ago! His is also backed with nice soft minky and got the same quilting. And the best part? The boys have no problem making their own beds now! This quilt was made with my Pow Wow pattern in a Twin size, it can be found here as a paper pattern or PDF. 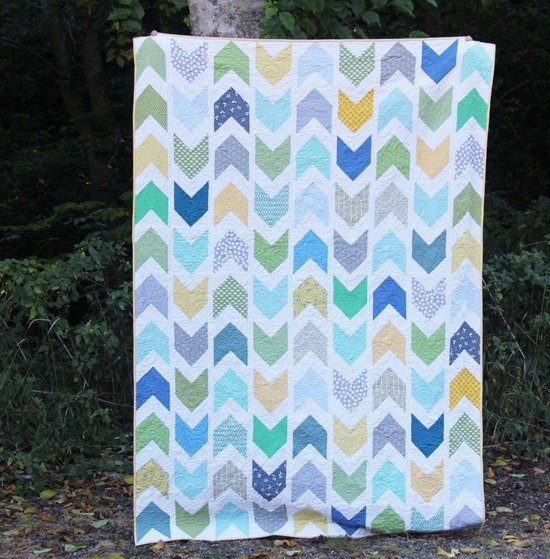 That is one gorgeous quilt – lucky boy! Changing bunk beds are a nightmare, fitted sheets help and I send my nearly 8yr old up to strip the bed and then she helps to put the fresh sheet on – sometimes! Oooh, love it! 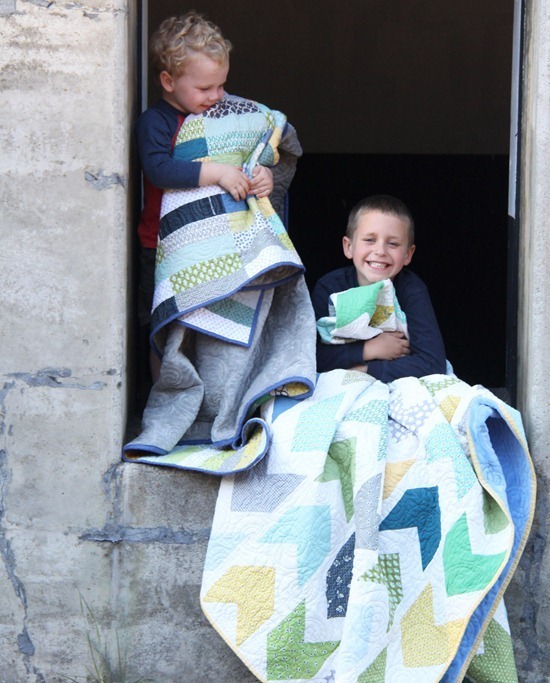 The quilts–and the boys–are adorable! When we had bunk beds for the kids, I always had them undo the fitted sheet at the side against the wall when it was time to wash the sheets, so then I could easily pull the rest of the stuff off the bed and wash it. Then, when it was time to make the bed, they'd hop up into the bed, put on the fitted sheet on the far side, and I was able to get the rest. Plus, it helped them realize that it was their bed that was being made and their responsibility. Great boy quilt – love it. Your quilts are absolutely gorgeous!!! Love the looks of bliss on those little faces….such cuddly quilts!!! Oh my gosh – that pic with both boys and their quilts is so sweet!!! Such a beautiful quilt and love the photos! I saw another one Svetlana made on Sotak Handmade that turned out great, too. Your pattern is wonderful. Have a great weekend! such gorgeous quilt. Funny thing, just a while ago I posted about finishing my son's Pow Wow quilt, too. Thanks for such a fantastic pattern, it's perfect for a boy. Omg that last pic is the best! Love it! We have one minky-backed quilt and there are fights over it daily. My DH is the worst of the offenders :-). Love your quilt and photos Allison!!! I used to get my hubby for that part. He could muscle the mattress better than me. Your two quilts are fabulous! Your quilts are beautiful. So are your little boys. I have no suggestions about changing the sheets on a top bunk. I have issues with heights. The quilts are wonderful. After spending a week with my brother and making bunk beds in my nieces' room I made up my mind not to get bunk beds for my girls because I HATED making them so much. If you do get any genius ideas on how to make them please share. I think it is so sweet that your son is going to the school you went to & even the same classroom! I like the color way you used for these quilts. And I adore your Pow Wow quilt. I am going to make it up for the quilt store I work at. I can't wait to get the patterns in & get to sewing. Beautiful quilts! I need to do some for my girls. May be They would make their beds more often. On our bunk beds I do the two corners closest to the wall and than the two corners closet to me. I than lay on the bottom bunk and pull them tighter around the mattress and adjust it from there. Those are both beautiful quilts. I like the soft color palette and the minky looks delicious. I'm oh-so-scared to try quilting it, though. Yours looks fabulous! I'm so glad I bought the pattern. I look forward to making my own quilt when the ordered fabric arrives. Yeah! I love looking at those quilts. How funny he's the same classroom – time flies!! We will be getting bunks for ours when the baby comes and needs it's own room so I read the responses eagerly! I would have just got the kids to climb up and pull off the far corners so I could just get the closer ones but now I think that flat sheet idea is genius and will have to remember that!! My boys have bunks (two sets!) and I hated climbing up there. Now they're big enough to help themselves, but sometimes I would just pull the mattress down onto the floor, make it up there, and then slide it back onto the bunk from the side (which sort of automatically tucks in the far side.) It helps to have another adult or a bigger kid to help slide the mattress back in. Love the quilt, I am trying to get inspired on how to quilt a tossed 1/2sq 9 patch…just …. I do not know if it helps but what I did when my older boy was younger and more apt to wet he bed (always the top bunk). When I would have to make up the beds I would have him help me and do the corners I closest to the wall. Once the fitted sheet was on I would lay a mattress protector (waterproof with flannel texture from the baby shop). It would almost cover his twin mattress, then I would put down another fitted sheet, 3-4 layers. So if we had a quick change in the night or no time in the morning. I could just rip off the wet sheeting, the protector, throw on a new flat sheet and quilt and the bed was made. I DO NOT DO Hospital Corners on the upper deck. Saves a lot of physical activity. such handsome little men with such wonderful quilts made with love. 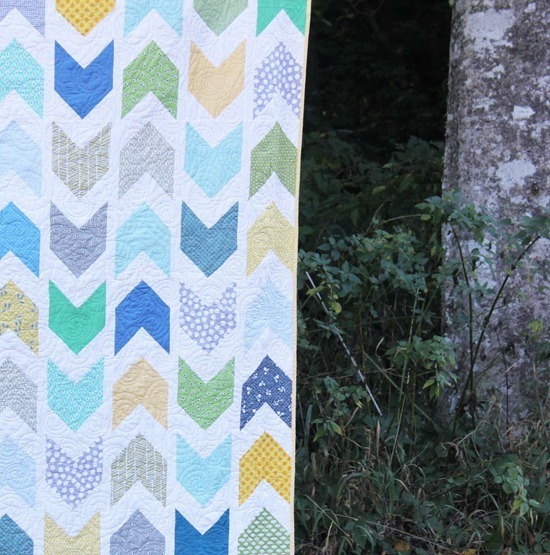 These quilts are beautiful and your boys are so cute! I had the same trouble making my daughter's bunk beds, and I just finished their quilts. Making smaller quilts has been a great solution. As far as the sheets, I just put a fitted sheet on their beds and left the top sheet off. It was just too much trouble for me. When it is time to change the sheets, I have my husband help me. I think if more people knew how difficult it was to make the bed on a bunk bed, then they would not sell as well. Your quilt turned out gorgeous! I also love the swirl. A long arm quilting stitch I am currently trying to master. When my boys shared bunks I had a light-weight dense foam matress on the top that I could easily lift. I only used a fitted sheet on the bottom and at times made the oldest boy climb up there to tuck things in. In summer it wasnt so bad because it was all light weight stuff but winter with flannel sheets was a little trickier. Try changing when your hubby is home so he can help! Good luck with it all. Yes, I hate the bunk bed changing as well. It is good exercise though. I LOVE Tracy Johnson's comment about layering the sheets though. Genius! I have a bed wetter too, so I will definitely implement that technique. I have never backed a quilt with Minkee. Isn't it really hard to quilt through? It is beautiful though! Two very wonderful quilts for two great boys I'm sure. I always had a hard time with bunk sheets. I had to crawl on the top. Isn't that why we have our children young when we are in better shape? I sure couldn't do it now! Nice job on the quilts. I never thought of using minky for backing. I like that. GET RID OF THE BUNK BEDS. They will out grow them anyway. Oh how lovely, both boys and quilts! My kids take the sheets off in the morning. I wash them. Then my husband helps me put them back on. He stands at the back of the bed and I stand at the front. He's tall though, so it works. Bunk beds save room but they are a pain. Like Julie G., I used to pull the top mattress down to the floor, put the sheets on there, then slide it back up onto the top bunk. After a while I gave up o that, and just put a sleeping bag on the top bunk! These quilts are just beautiful!! And I love the photo of the boys snuggling their quilts — adorable! I usually had my children change the sheets on the top bunk! Great quilt! My mum used to make me change my top sheets haha, I guess she had the same problem! Top bunks and day beds are REALLY hard beds to make! (my daughter has a day bed as a bed). Good luck with finding an easy solution! What a great design, and the colors are so nice. I like both your boy quilts. I have sewn the bottoms and up one side of the sheets together, the fitted and top sheet. It makes it a lot easier to make the bed. We had bunk beds for my girls. I was not physically able to climb up to change the sheets. I made a zippered sheet cover for both mattresses and then made them sleep bags that had a sheet on the bottom and a quilt on the top. I just pulled the bags off the bed and washed them and then could just sort of spread them out on the mattress when I made the bed. That worked great and the girls thought they were camping out every night. You've beautiful children…and I see they really love their quilts, which by the by, are just plain gorgeous. I always pulled the mattress off, put on the bottom sheet and then pushed the mattress back up. The kids always made the bed from then. Of course I am talking about when they were very young. I haven't changed sheets on their beds in years. They seemed to love doing it themselves from a very early age. Lol, it was some kind of game getting beds made. Of course, I should explain they slept in those elevated beds where the desk fits under it. One bed set has already been disassembled in favor of a twin down here where the rest of us are, lol. 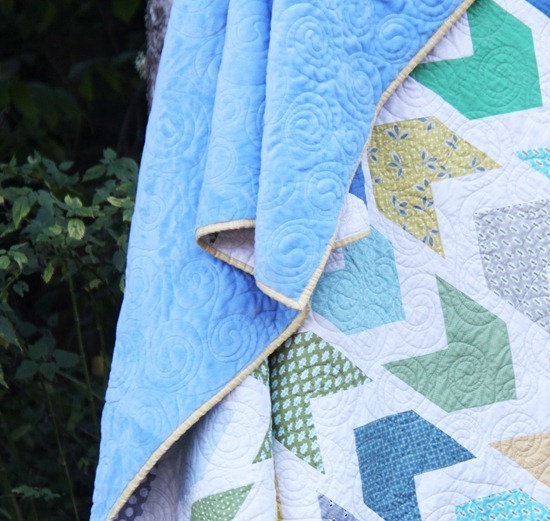 Beautiful quilts… I love the minky on the back! Today I found these sheets that are inseparable on one side, making a bed against a wall much easier to make. I don't know if this solves your problem, but it is an idea anyway. You could even sew sheets together yourself and save a bundle of cash. this quilt is gorgeous. how would I go about getting the pattern? Layers! For my sons top bunk I have three sheet sets and three waterproof mattress pads. Pad,sheet,pad, sheet, pad, sheet. Simply rip off the top set and change the top sheet and you're done! I just bought the pattern. I was wondering if you used the 17 assorted 1/4 yards in his blanket or the 9 1/2 yards. Thank you!